Susan Collins of Maine, Lisa Murkowski of Alaska, Dianne Feinstein of California and Patty Murray of Washington all show flashes of the independence that defined McCain's career. WASHINGTON — John McCain is being remembered as a last lion of the Senate, with few others matching his stature. But the next generation of mavericks might come from the ranks of Senate women. 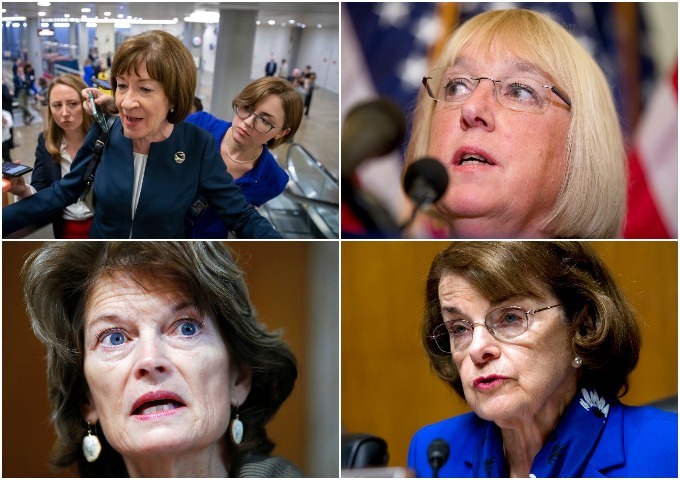 Susan Collins of Maine, Lisa Murkowski of Alaska, Dianne Feinstein of California and Patty Murray of Washington are all positioned to have enormous influence. Republicans and Democrats, they show flashes of the independence that defined McCain’s career, particularly his role as a legislative check on the executive branch, including President Donald Trump’s White House. But like so much in the Senate, where seniority is respected and tradition matters, there’s not yet consensus on what to call the leading ladies. The lioness label isn’t one preferred by Debbie Walsh, director at Rutgers University’s Center for American Women and Politics. She said it sounds “diminutive” compared to the roles they play. Women in the Senate, she reminds, ended the last two government shutdowns, with Collins this year gathering senators around a talking stick to resolve their differences. “There’s a gender component to it — our image of who a lion can be is frankly old white men,” Walsh said. But as the Senate starts to look more like the America it represents so, too, does the roster of its top senators. The top women in the Senate are willing to buck their party now and then. Reach across the aisle to cut deals. And they eagerly position themselves at the center of the most important issues of the day. The men of the Senate aren’t necessarily losing ground. They still make up the majority of both parties, hold most of the committee gavels and, in the GOP, fill the top five leadership slots. Murray is the fourth-ranking Democratic leader in the Senate. It’s just that McCain was a league apart in the chamber, following in the footsteps of towering figures like Joe Biden, Ted Kennedy and Bob Dole. Jack Pitney, a professor of American politics at Claremont McKenna College, said one reason for the lack of lions is the partisan divide that has polarized modern politics. Many of today’s lawmakers are fearful of primary challenges if they stray too far from the party line. But it’s also personal. McCain brought a charisma of his own — sparring with reporters in the halls, pushing the party’s direction or simply gumming up standard operating procedure with his votes. “Whenever you lose strong, independent personalities like that, the Senate loses something,” acknowledged Sen. Lamar Alexander, R-Tenn., himself a potential lion who seeks to uphold Senate civility and broker bipartisan deals. Tennessee GOP Sen. Bob Corker, the Foreign Relations Committee chairman, sometimes plays that role, but he is retiring, as is another Republican, Arizona Sen. Jeff Flake, a frequent Trump critic. Up-and-comers in the Senate show bouts of independence from party and presidency, but also a cautious reluctance to fully engage the fight the way McCain did. Several high-profile senators seem more inclined to use the chamber as a springboard for their own runs for the presidency. And Senate veterans of both parties increasingly tend to stake out their partisan corners. But lions require an everyday presence to raise — and maintain — their stature, and that’s where the women, at the moment, are particularly skilled. Murkowski and Collins, both Republicans, can easily sway the outcome of legislative fights, as they did last year when they — and McCain — blocked the GOP’s repeal of President Barack Obama’s health care law. This fall, they will likely make or break Supreme Court nominee Brett Kavanaugh’s confirmation. Representing opposite ends of the country, Alaska and Maine, they both come from states that have rewarded their independent streaks. Murkowski stunned Washington when she won a write-in campaign to re-election in 2010, only the second senator in history ever to do so. She and Collins are among the few Republican women who lead committees. Feinstein, a Democrat, is the Senate’s sixth-ranking member by seniority, arriving in 1992, almost five years after McCain and just a few months before Murray joined as part of the first year of the woman, which boosted their ranks in the Senate. Feinstein has battled both parties, in successive White Houses, particularly over enhanced interrogation techniques used on terror suspects and allegations of the CIA spying on the Senate when her team was writing the torture report. Murray is a behind-the-scenes broker of bipartisan budget and health care deals, deep in the weeds of domestic policy. “Lions are senators who can put the country and the institution ahead of their party and constituency — and who have the power to make a difference,” said Pitney. But McCain’s wingman in the chamber, Republican Sen. Lindsey Graham of South Carolina, says he’s not necessarily the one. “Don’t look to me to replace this man,” Graham said in a eulogy, calling on colleagues to emulate his friend.